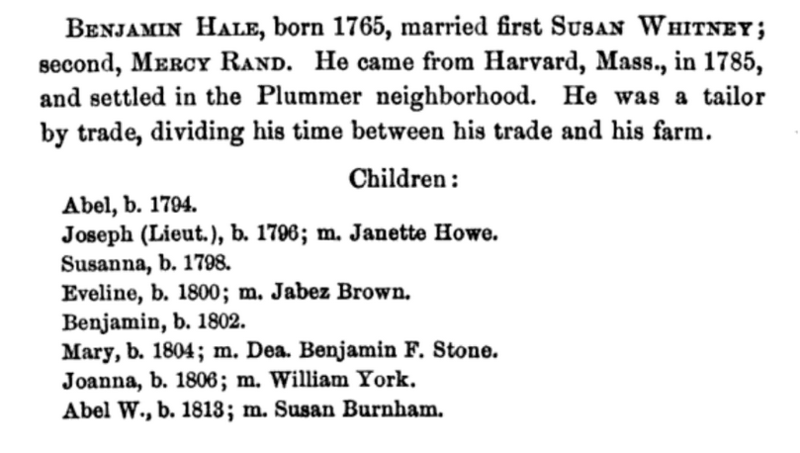 COLBY FAMILY & OTHERS, at http://freepages.genealogy.rootsweb.com/~colby/colbyfam/d300.html citing FHL Number 1001263; Birth and Marriage Index for New Hampshire. COLBY FAMILY & OTHERS at http://freepages.genealogy.rootsweb.com/~colby/colbyfam, /d300.html. "United States Census, 1940," database with images, FamilySearch (https://familysearch.org/ark:/61903/1:1:K4BV-915 : accessed 6 December 2016), Barbara Hinckley, Ward 9, Newark, Newark City, Essex, New Jersey, United States; citing enumeration district (ED) 25-257, sheet 1A, line 34, family 9, Sixteenth Census of the United States, 1940, NARA digital publication T627. Records of the Bureau of the Census, 1790 - 2007, RG 29. Washington, D.C.: National Archives and Records Administration, 2012, roll 2419. Abel Hale was born on January 4, 1795 in Waterford, Oxford County, Maine. Abel died on November 4, 1797 in Waterford, Oxford County, Maine, at age 2. Abel Whitney Hale was born on May 6, 1813 in Waterford, Oxford County, Maine. Abel died on March 2, 1887 in Waterford, Oxford County, Maine, at age 73. 1880 United States. Census Office. 10th census, 1880 federal population census, Washington, District of Columbia: National Archives and Records Service, ([19--]) , FHL Film 1254484; National Archives Film T9-0484; Page 356B. 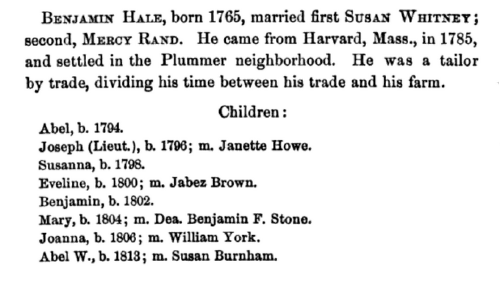 Robert Safford Hale, Genealogy of descendants of Thomas Hale of Watton, England, and of Newbury, Mass., , at https://archive.org/stream/genealogyofdesce00hale . Albany, N.Y.: Weed, Parsons and Company, printers, (1889) , p. 106.
living at Bethel, Oxford County, Maine. Albion died on July 3, 1892 in Waterford, Oxford County, Maine, at age 72. Consolidated Lists of Civil War Draft Registrations, 1863-1865, Washington D.C.: NM-65, entry 172, 620 volumes. ARC ID: 4213514. Records of the Provost Marshal General?s Bureau (Civil War), Record Group 110. National Archives, , Maine > 2nd > Vol 1 of 5, Class 1, A-L > 395. 1880 United States. Census Office. 10th census, 1880 federal population census, Washington, District of Columbia: National Archives and Records Service, ([19--]) , Census Place: Waterford, Oxford, Maine; Roll: 484; Family History Film: 1254484; Page: 359C; Enumeration District: 140; Image: 0843.